While Apple’s fortunes are undoubtedly on the positive side these days, any good company is continually looking to the future, and trying to build a user base that will continue to grow is part of that strategy. One way of managing that is to make products which appeal to kids, with the theory being that as they grow up, they will continue to buy your products and then hopefully their kids will, too. According to a new report by Neilsen, Apple is well on its way to pulling that off, with the news that three of its products currently top the wish-lists of kids this Christmas. The three products wished for by kids this year are iPhones, iPads and iPod touches, a clear sign that Apple is doing something right somewhere. It also means that while Apple is getting their customers at an early age, they are also getting them accustomed to the idea of buying their apps, music and other media via Apple’s online stores – a veritable cash cow for the Cupertino outfit. With iOS devices acting as a gateway drug to the young now, they may even grow up to be Mac buyers in the future. Apple’s three iOS devices sit proudly at the top of Neilsen’s most wished for devices, beating out some illustrious and more likely competition. Sixth in the list is Nintendo’s 3DS handheld gaming system, the highest ranked tradition gaming platform. Microsoft’s Xbox Kinect sits just below it, with Sony’s PlayStation 3 and the Xbox 360 further down the pecking order. Game companies take note, players of games are not necessarily playing them on consoles and handhelds these days. 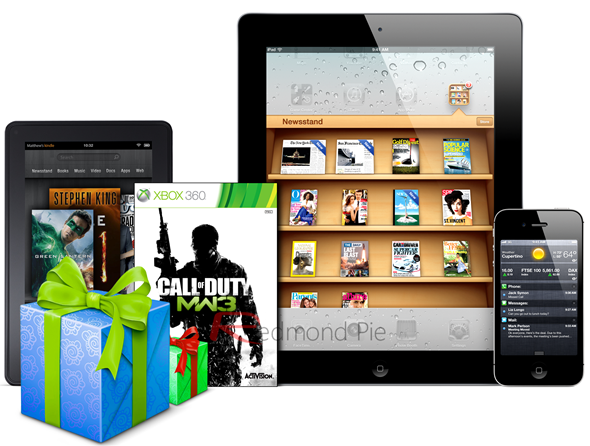 …the iPad increases its stronghold, with nearly half (44%) of kids expressing interest in the product, up from 31 percent in 2010. 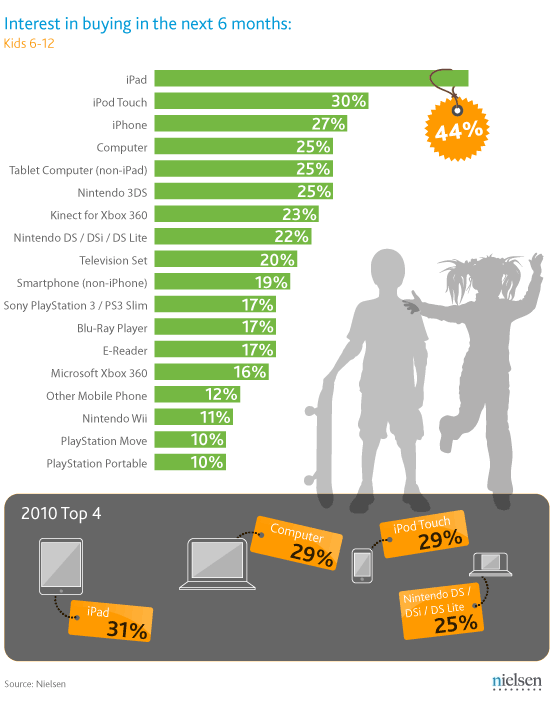 Two other popular Apple devices – iPod Touch (30%) and iPhone (27%) – round out kids’ top three, with computers and other tablet brands each appealing to a quarter of younger consumers. While all this makes for interesting reading, we won’t really know how things have panned out at the cash registers until January, when companies begin releasing their holiday says figures. Will the sales numbers reflect Neilsen’s reported levels of interest by kids, or will parents choose differently?